Aerospread – Update & A Very Merry Christmas!! Wow nearly at the end of 2018 – and what a year it has been!! 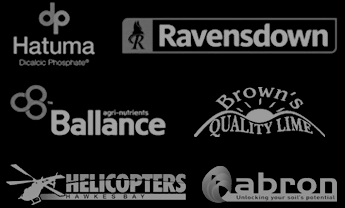 Aerospread has grown hugely, from 10 staff to a whopping 16, with new Operations staff, Loader Drivers and Pilots! We welcomed Pilot Pete Harding and newly appointed Manawatu Operations Manager, Warren Smith, when we purchased Griffin Ag Limited’s topdressing division. This has been an exciting time, with lots of new faces and new experiences. It has been a pleasure getting to know all our new clients, understanding their needs, and how we can best help. Read the full newsletter below. I’m waiting for the weather to clear for flying, so I thought I’d send a quick newsletter. I’d have to say, this season has been one of the trickiest I’ve known in my 25 years of top-dressing! As you’ll know November and December saw some very dry periods and we got a bit scared it may turn into full-on drought! Thankfully in late Jan the rain arrived – this meant that a lot of farmers were hanging onto stock. Stock prices were good – it’s great to see prices stay up after Christmas and farmers being rewarded for the efforts and commitment they give to the Ag industry!